Our Mission is to act as the essential stepping stones to children’s growth and lifelong learning. 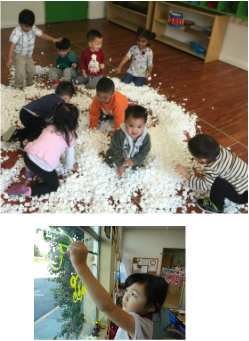 We create developmentally appropriate curriculum which fosters children’s cognitive, social, physical, emotional and creative needs. Our program provides an environment full of enriching tools and materials where children can construct their own learning. Our focus is to instill curiosity, wonder, imagination, and creativity in every child and emphasize exploration and hands on learning through play. In doing so, we greatly value family and community and their contributions toward children’s learning experiences. The video below is an animation depicting the different art projects that each class completed throughout the year. Each class chose a theme based on the children's' interests and worked in small groups or individually to create all of the different projects.